We had a great session at our Women in Family Business Peer Group! 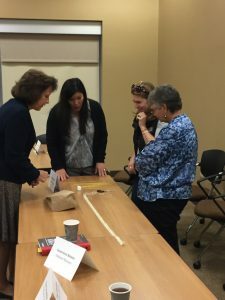 We started off with the Marshmallow Challenge: Two teams of 4 were tasked with building the tallest structure they could manage using string, tape, and dry spaghetti. A jumbo marshmallow had to be placed on top – and the structures remain sound – in order to succeed. The tallest structure wins! 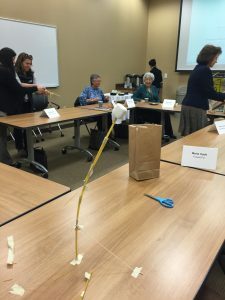 Here is a great website on the ins and outs of the Marshmallow Challenge and who performs best – it’s not who you might think! (Spoiler: kindergarteners outperform CEOs and recent MBA students.) The 6 minute Ted Talk is worth your time. Also of note, Success Magazine – bi monthly and includes a CD. If you are interested in personal and business development, this list is a good place to start. Happy Reading!